The ADA Restroom Trailer + 2 Station Compact | Comfort Series offers a manageable 16 ft trailer length. 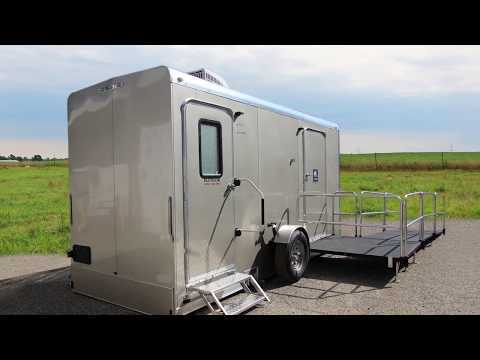 This trailer features 2 compact unisex suites and 1 large ADA suite with self-storing ramp system. Each standard restroom suite features pedal flush toilet, corner sink with metered faucets, shatterproof mirror, and abundant interior lighting. The large ADA unisex suite features a full flush toilet, accessible sink with shatterproof mirror, and grab rails. The ADA suite allows for a full 360° turning radius for wheelchairs. All suites include dispensers for hand soap, paper towels, and toilet tissue. Your guests are sure to enjoy the comfort of a fully climate-controlled environment maintained with air conditioning and heat strips in this ADA restroom trailer! ADA Ramp Dimension: The easy to set up ADA ramp is made up of four sections. Down ramp section 1: 36"x72"
Down ramp section 2: 36"x72"
Transition from ramp to ground: 34"x12"
The ramp is 60" wide x 216" long with 84" of ramp past the end of the trailer. Download a 1 page PDF Product Description for the ADA Restroom Trailer +2 Station Compact | Comfort Series from Portable Restroom Trailers, LLC.